May 11, 2016 By Umbra Winery in news-events Comments Off on Restaurant Wine Lists: Are Restaurants Leaving Money on the Table? Restaurant Wine Lists: Are Restaurants Leaving Money on the Table? Briefly, the Overton Window is a concept taken from the world of political analysis. It refers to the range of public policy options that are deemed generally acceptable at any particular moment. Political success, according to this theory, is all about either embracing the window to gain public support or finding ways to shift it in the direction you favor. Financial Times columnist Tim Hayward applied the Overton Window concept to restaurant food. He noted that many creative chefs find themselves constrained by the customer Overton Window and the need to have “safety food” options like hamburgers, simple fish and chicken dishes, etc. so that customers feel comfortable coming to the restaurant. If you choose to ignore the window conventions, you risk losing customers and ultimately your job. Hayward speculated that the most successful chefs stick to the window, but work on the edges to express creativity without leaving their customers behind. I had more to say about this, of course, including some comments about giant hairballs, so you might want to read last week’s column if you haven’t already done so. The thesis is suitably complicated and probes many questions. I am going to simply (and probably over-simplify) and focus on just a couple of the results. Davis wanted to understand the difference between wine programs in value restaurant chains (such as Wetherspoon’s and Harvester in the UK) and premium restaurant chains (such as Wagamama and Carluccio’s) and while he did not use the concept of the Overton Window, I think you will probably see why I think it applies. Davis noted that when it comes to popular brands of beer and spirits, consumers expect to find them in both value and premium restaurants. The beer and spirits lists of the two types of restaurants aren’t identical by any means, but popular brands that are available in the shops are likely to be found in both types of establishments. This is consistent with the concept of staying within the consumer comfort and acceptance window. 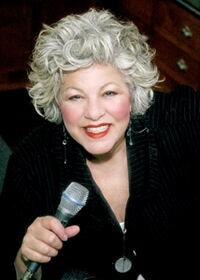 Davis noted that the conventional wisdom is that wine is different from beer and spirits when it comes to popular brands. Widely-distributed wines like Hardy’s and Jacob’s Creek are likely to be found in the value outlets, but are not typically found in the premium segment. In other words, the restaurant wine windows are assumed to be much different. His research of the chains’ wine lists generally confirmed this finding, indicating that the restaurants treated wine a bit different from beer and spirits in terms of the types and range of brands on offer. So, if you are following me so far, it seems that restaurants may be using their wine lists to communicate their identities (as value versus premium) more than they do with beer and spirits. Interesting, but is wine really so different from beer, spirits and food? Are the value and premium wine windows so very different? Davis then surveyed consumers and he found that many of them would have ordered wine at the premium restaurants if there had been a popular brand on the list. In other words, the windows in the two types of establishments may not be so distinct as conventional wisdom suggest. This seems to me to be consistent with Tim Hayward’s hypothesis about restaurant food. Consumers want those safety options and you ignore them at your peril. Given that a widely available “safety wines” might be pretty popular (think Kim Crawford Marlborough Sauvignon Blanc, for example, or Mondavi Napa Fume Blanc) I am not sure about the logic of avoiding them entirely, even if you want to construct a list that probes the creative boundaries or defines an image. As I said before, Davis explores more topics and provides more analysis, but this is where I will stop. My purpose is simple: maybe we should re-examine what we think we know about what works best for restaurant wine. I’m not recommending that fine dining establishments limit their wine lists to what a consumer can find a Kroger’s or Tesco, just suggesting that broadening the list to include more popular (and probably cheaper) wines that fall squarely within the generally accepted wine window might improve wine sales while making customers happy, too. If a restaurant is willing to offer a gourmet hamburger to give nervous customers something to hold on to, maybe there should be more similar wine choices available. Many do this, of course, but sometimes it seems like all the attention is on other parts of the wine list. I have written many case studies of different industries over the years and one thing I have found is that each sector confidently believes that it is different from the rest. And of course important differences do exist. But it is wise not to ignore potential lessons from other product categories, especially when consumers see them as part of the same experience as they are likely to consider restaurant food and beverage choices. A quick note about limitations. Davis’s study is obviously limited to those value and premium dining multiples that he studied in the UK and the consumers he surveyed there. Use caution in generalizing to other countries and other types of dining establishments. Also please note (as if it isn’t obvious) that my concern here is increasing wine sales and the restaurants may be more interested in other things. Perhaps there is more profit (or faster table turnover) with beer or cocktail sales. May 11, 2016 By Umbra Winery in news-events Comments Off on Beautiful bottle of red! 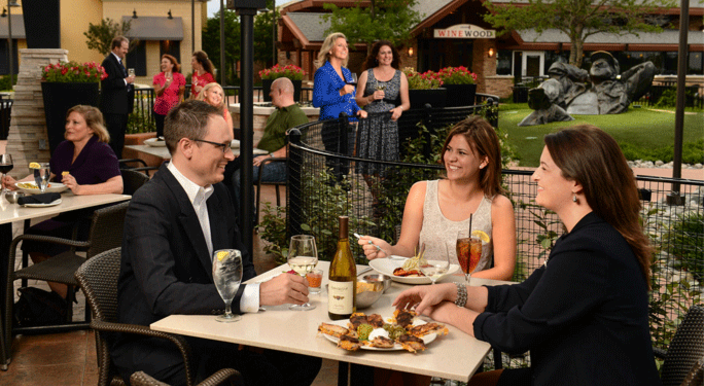 Whether you are flying on business or traveling with your family, use your layover to experience Historic Downtown Grapevine with unique shopping and dining options. You can plan an entire getaway around Grapevine’s Urban Wine Trail, including visits to one of the six participating wine tasting rooms. Please click on the button below to download a PDF with all the details. shops to peruse the wares of local artisans sound like a movie where YOU play the leading role? Umbra Winery is thrilled to offer you such an experience. We have partnered with a local tour company to create an itinerary that will leave you longing to return to La Dolce Vita again and again. To ensure a unique and intimate experience, this event is limited to 20 persons and is initially exclusive to Umbra Wine Club members at a preferred price. In the event spaces remain available, we will open registration to non-wine club members. awake daily pinching yourself to make sure you are not dreaming! lunch and incredible views of Chianti followed by shopping in the ancient town of San Giamignano for pottery, linens and more! 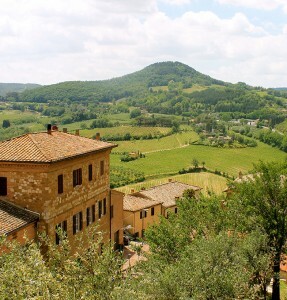 A Truffle Hunt in the charming hill town of San Miniato. Enjoy a pleasant walk together with Massimo and his truffle dogs and learn about this unique delicacy. After the truffle hunt arrive at a local restaurant where Massimo will show you how to prepare the truffles for your delicious lunch. After, we visit a biodynamic olive oil farm for a tour and tasting the old fashioned way. 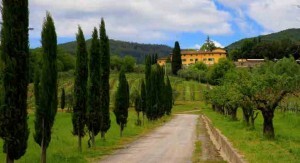 Then we make our way for dinner in the Chianti Pisani area called “Carmignano”. Carmignano is a red wine that includes grape varietals Cabernet Sauvignon and Sangiovese. Florence Food Lovers Tour. Learn about the history of Florence’s local and regional cuisines while exploring the city’s small alleyways and walking through charming local suburbs. We’ll enjoy tastings at local merchants of biscotti, aged balsamic vinegar, olive oil, and a local delicatessen. You will have the afternoon free to shop and sight see. Enjoy dinner in the city center before returning to your accommodations. pool or reading in the garden. We’ll then cap the day off with a memorable dinner at Dario Cecchinis restaurant, the famous butcher of Panzano. Cortona and Vino Nobile di Montepulciano. Visit the picture perfect hill town of Cortona. Meet for lunch at a charming local restaurant in the town center. In the afternoon we will visit an exclusive boutique wine estate, by far one of the most beautiful in the area, for a tour and tasting. Visit the cellars and the most prestigious production of Vin Santo and Occhio di Pernice in Tuscany aged for a minimum of 20 years. After a tasting, we’ll return to the estate for a farewell dinner with your newly made friends. And we’ll warn you – it isn’t uncommon for tears to flow reminiscing of how this trip has truly been the trip of a lifetime. *Sequence and content of itinerary subject to change based on availability, weather, etc. Up your fruit intake at Umbra Winery, a new wine bar and tasting room from the same-named Texas vino makers, soft-open now and grand-opening Sunday in downtown Grapevine. This place is part of Grapevine’s urban wine trail, so you can make a day of it or swing through as part of a broader mission to sample as many local wines as you can. Either way, you’ll find a hospitable situation here of brick walls, wooden barrels and a brightly colored bar. 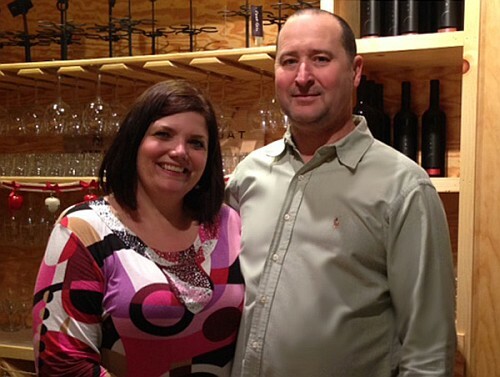 John and Debbie Wilson fell in love at a wine tasting event in Irving in 2010. Their courtship involved their shared affinity for vino with visits to Sonoma and Napa Valley, both in California. Their June 15, 2012, marriage was followed by a honeymoon in Italy, known for its vineyards, and a place where they reveled in their love with La Dolce Vita. or the sweet life. Both had corporate jobs, his as a chemical engineer in East Texas. His commute took up valuable time away from their time together in their home in Prosper home, north of Dallas. December 19, 2014 By Umbra Winery in news-events Comments Off on Umbra Featured on Texas Wine Lover! Umbra Featured on Texas Wine Lover! Grapevine, Texas is well on its way to achieving critical mass with its Urban Wine Trail, and my husband and I recently got to experience yet another appealing example in the warm, inviting atmosphere of the Umbra Winery tasting room. December 19, 2014 By Umbra Winery in news-events Comments Off on Look for Umbra in the Community Impact Newspaper! Look for Umbra in the Community Impact Newspaper! 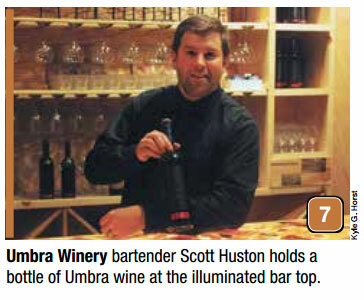 Owner John Wilson opened Umbra Winery in November at 415 S. Main St., Grapevine. The winery includes a tasting room that is open seven days a week. Wines served are produced locally. December 10, 2014 By Umbra Winery in news-events Comments Off on Grapevine’s Urban Wine Trail! Umbra Winery was recently featured on Good Morning Texas. More information about the Grapevine Urban Wine Trail can be found on the Grapevine Texas website.